You know what the old phrase says – “It takes money to make money.” Although I think that's true in many cases, it's not true all of the time. 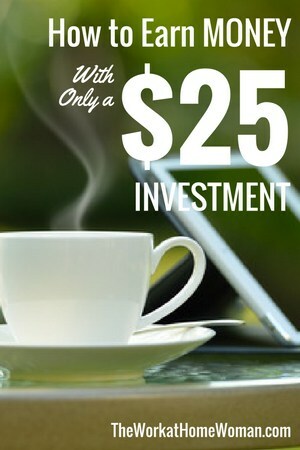 There are times when you can make money with only a $25 business investment … yes, it's true! I thought you might be skeptical; that's why I've included plenty of examples below. Now, these are not ‘get rich quick' schemes by any means, so you won't find any advice about buying lottery tickets or betting on horses at the track. 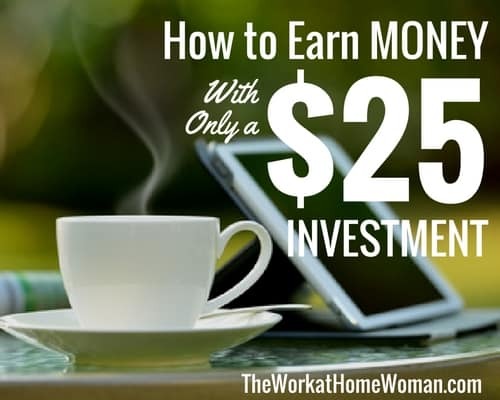 These are ways you can make money whether it's through a side gig or starting your own business, all for only a $25 business investment (or less)! Here is a list of ideas to help you get started. This could be something that you do only on occasion, and there's no investment needed for the most part (unless you need to get a few toys or babyproof your home). You'd be amazed how many people don't like to leave their houses vacant when they go on vacation. You can keep watch on a home and do things like water plants, pick up the mail, and bring in the newspaper. This is a great side gig as you only do it as often as you'd like. That could mean once a month or twice a year; it's totally up to you! Create a few business cards or flyers, advertise in Facebook groups and boom! You're in the house-sitting business. Pet Sitting entails the same guidelines as house-sitting, only you need to enjoy and be good with animals. You should be able to feed them, give medication, take them on walks, play with them, and clean up after them. For a true animal lover, this is a fun gig and not much like work at all. Apart from a little advertising expense (which you should be able to keep under $25), it's free to start up. Whew, that was a lot of sitting! But you get the picture. Running errands is an option to earn money with low start-up costs. You can either get gigs through an online service site or find your own. For more information, check out How To Make $18-$35 an Hour Running Errands. Thanks to Uber, you don't have to have a fleet of taxis to become a driver. You can make money driving your own vehicle and meet some interesting people to boot! You can put $25 worth of gas in your tank, and you're ready to get started, learn how much you can make as an Uber Driver here! If you don't mind a little housework, you can start a housecleaning side gig with only a $25 investment in cleaning supplies. Some people will even provide them, but most prefer you bring your own. There is a staggering number of elderly people who need help in their daily living situations, with everything from personal grooming and household upkeep, to running errands and cooking. Although there are many agencies where you can work if you'd like this to be your full-time job, you can also offer this service yourself as a part-time gig and only take as many clients and hours as you want. Start up cost: Nothing, unless you choose to spend money advertising your service. I did this for almost a year. Every Saturday I'd faithfully go down and sell in my ‘little shop', which was actually a small space I rented in a newly built beautiful barn in town. I didn't make my own items, but I sold other products invented or created by moms. Although I didn't make a killing doing this, it was a super fun experience. I met a lot of people and made a ton of friends. You can definitely spend more on a venture like this, depending on what you're selling, but to sell handmade crafts of your own, you may be able to get started with a minimal investment. The great thing about freelance writing is the fact that you can start with zero funds! Although your own website is recommended, it's not what's entirely necessary in the beginning – clients are. And you can find clients through Facebook groups, Twitter, LinkedIn, and even job boards if you choose to go that route. You can always invest in your business later on (in fact, I highly recommend this course), but you can do it as your business and income grow. If you love to write and have knowledge, passion, or the willingness to learn about a particular topic, starting a blog might be for you. Blogging can lead to all kinds of money-making opportunities, from sponsored posts and affiliate income to creating and selling your own products and advertising. You can even start a blog for free, but I recommend having your own hosted site. It will cost a bit of money to start, if you pay by the month instead of yearly, you can do it for less than $25. Sometimes you can even secure a great deal and get a whole year for under that price! How is an e-commerce site different from a blog? Think of it this way: While a blog is more of a site where you go to find info and you sometimes purchase it in the form of e-books or other products, an e-commerce website or store is specifically a place to shop. A few sites make it easy to do this, such as Etsy, eBay, and Amazon. If you prefer customization and integration with your own website, you could try Shopify or WooCommerce. Some sites are free to join, some have a listing fee for items, others take a portion of the sale, and several require a monthly fee. For example, Shopify costs a minimum of $29 a month (just a few bucks over our $25 limit), and you can set up an eBay store for $24.95. Etsy doesn't charge a monthly fee, but they do have a $.20 listing fee, a transaction fee, and a payment processing fee. Are you always the one in the crowd who creates funny or relatable catch phrases? Or maybe you're good at creating graphics? Then you might want to consider designing and selling your own T-Shirts! While there are many ways of doing this, to have the absolute smallest investment upfront (some places it's actually zero! ), you can use an online T-Shirt website. To find more info about going that route and selling t-shirts online, read this post. You can also work with a local printing company and have your shirts made to sell at events and in small boutiques. Unfortunately, that route requires a lot more than a $25 investment, so I'm sticking with recommending the above option. If you like being on camera and video is your thing, consider creating a YouTube channel. There are several ways to earn money that include ads and YouTube Red subscriptions. YouTube Red members pay a recurring fee to be able to watch content without ads. You can also work with brands, sell your own merchandise, create events, and more. The best part is that it doesn't cost a dime to start your YouTube channel, other than your video materials like a camera, lighting, etc. But to start off, you can simply use your cell phone. Maybe you have skills that would help another business owner, like editing, email management, creating graphics, social media management, and more. Then becoming a virtual assistant might be a good way for you to earn money without a huge investment. A website is helpful here but, again, not necessary. You can find clients on social sites like Facebook and Twitter. I would recommend taking a course if you're just starting out. A course could help you navigate the “How do I get started and what do I do now” phase. If you're interested, you can learn more about the one I took here. This isn't your mother's Avon! Only $25 to join, and you don't have to go door to door anymore. (Although if that's your thing, it's still totally fine!) They sell everything from makeup and skincare products to jewelry, handbags, and clothing. They have been around forever, and it's not likely they're going out of business anytime soon, so you have the reassurance of joining up with a longstanding company that has an awesome reputation. Sell lockets, charms, leggings, tote bags, personalized items, and custom jewelry. You can get started for only $10. With a wide variety of products ranging from bedding and blankets to kitchen tools and household decor, you can get started as a consultant with Linen World for free. That's right: Zero investment to start. It's worth looking into if you're looking to start a business on a shoe-string budget. As you can see, there are a number of ways to earn money with a $25 business investment (or less!). Have more ideas? We'd love to hear about them in the comments! Linen World is the best. Awesome company to work with. Tell them Lori Jordan referred you.